NEW YORK — Of the previews and screening at NY Comic-con, one film stood apart and out of place from the rest. Summit Entertainment’s “The Hurt Locker,” is about an Army Explosive Ordnance Disposal team (EOD) that is stationed in Iraq during the current war. Comic-con has grown from a convention featuring solely comic books to include video games, movies and television shows, but all have a similar nerdy trend that ties them together. “The Hurt Locker,” directed by Kathryn Bigelow (“Point Break,” “The Weight of Water”) and starring Jeremy Renner, is a serious, weighty film that already has earned critical acclaim at the 2008 Venice Film Festival. At Comic-con, Blast had an opportunity to sit down with Renner and talk about the long and difficult filming process the film required, which took place over three months in Jordon. For the film, Renner spent weeks training with an actual EOD team, and found out they weren’t like he was expecting. “First I was in shock at how, for lack of other words, nerdy they are,” said Renner when describing them and how they operate. They weren’t the stereotypical meatheads he expected, but rather interesting people with stories and lives like everyone else. In the movie, Renner plays Staff Sergeant William James, a hot shot bomb diffuser. Renner said that it took a while for him to fully develop the character. Despite jut being a “cowboy” on the surface, as the movie goes on, James becomes more of a person, and that took some work to develop. Much like the actual EOD team that they shadowed and trained with, these characters aren’t what they appear on the outside. They are people, with the war as a backdrop, not the same soldiers with different names. Renner made it clear that this was a war movie, not a critique on a war many have come to despise. It’s about the people in these poor situations, not about any of the politics of war. That fact might save this movie from damning reviews that other movies set in the Iraq war have received. It isn’t political; it isn’t about why the war happened, but rather about three people getting through their time in the sun soaked desert. Renner discussed how his roles in “The Hurt Locker” and “SWAT” familiarized him with military knowledge, specifically with gun use. He seemed a bit tense when this subject came up saying only “Do I love guns? I think they are interesting” and explaining a respect for the tool. The mood got a lot lighter when the discussion of the movie’s signature bomb suit came up. For everyone who hasn’t seen an EOD bomb suit, picture a cross between the first Russian cosmonaut suits and the old deep sea diver suits. 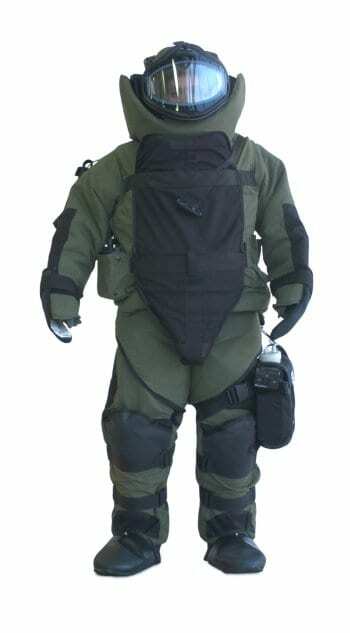 The suit weighs over 100 pounds, and is meant to absorb the impact of a bomb detonated mere feet away. Eventually, he said, the suit became an escape for him. Inside its giant bell of a helmet, he watched the world go by while listening to Beethoven. Explaining that the suit was 10 to 15 degrees hotter than the already scorching Jordon, made him feel unbreakable. When he finally would take the suit off, it was felt like taking a dip into a pool, he said. Renner said the crew behind “The Hurt Locker” was one of the best crews be has ever worked with and they ended up becoming close because they were filming so far away from home. When questioned about director Bigelow, he said she was the toughest person out there. When the reporters started to laugh at his comment he stopped them, saying that it wasn’t a joke, and he had no idea how she put up with everything, all while under the rays of the hot sun. Renner said he surprised that Jordon, the United States biggest ally in the Middle East, wasn’t all wind and sand but was actually incredibly westernized. It didn’t have all the amenities the United States is known for, but he was surprised to see that the world was not as far behind as he thought. Renner is staying in New York after New York Comic-con for some reshoots on “The Unusuals,” a new ABC dramady that follows police detectives who have to solve the unusual cases, hence the name. He said he also has expressed a lot of interest in the not-yet cast “The Losers,” a film based off the comic of the same name. Keep an eye on Renner as press for “The Hurt Locker” continues, because he’s going to be huge after it hits theaters and gets the Oscar cred it duly deserves.